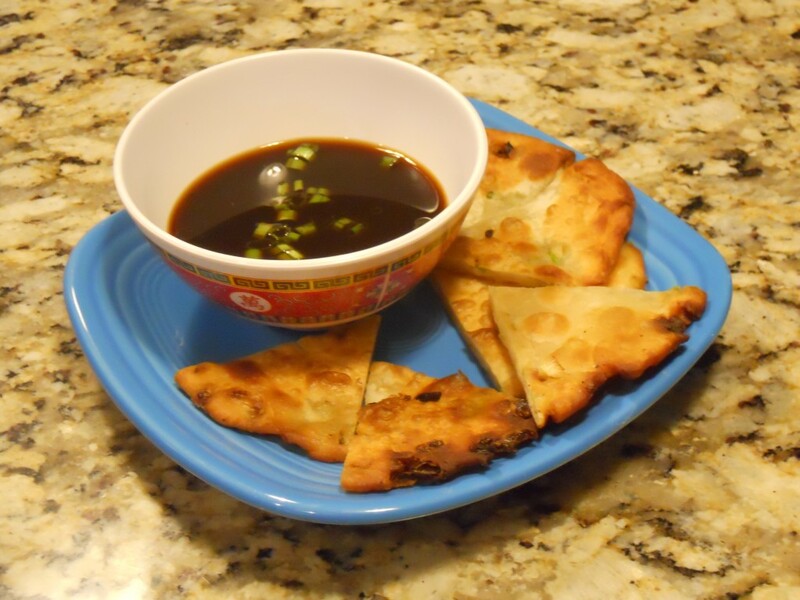 Glass of Fancy » Blog Archive » Let’s Lunch: Scallion Pancakes - Fashion, fiction, and life in the city. If loving salty fried foods is wrong, I don’t want to be right. It’s time for this month’s blog round with Let’s Lunch! I’m happy to be back after a couple of months of kitchen catastrophes and life crises, and just in time to celebrate the release of The Marijuana Chronicles, the brand new anthology including a short story by Let’s Lunch’s own Cheryl Lu-Lien Tan! I do, however, feel totally confident in recommending scallion pancakes for anyone feeling the urge for a little snack. Hot out of the pan, they’re crisp, salty, and entirely delicious. I use Martin Yan’s recipe because a) Martin Yan’s good cheer and enthusiasm for cooking never fail to delight me, and b) it’s a damn good recipe. I have made these many times for parties, and they always get eaten down to the last crispy triangle. Always. On a lightly floured board, roll dough into a cylinder and cut into 12 equal portions. Cover all unused dough while making cakes. To make each cake, roll a portion of dough into an 8″ circle approximately 1/8″ thick. Brush with a thin film of shortening and then sprinkle with sesame oil, green onions, salt, and pepper. (You can be fairly generous with the salt and pepper since the dough is entirely unseasoned up until this point.) Gently roll dough into a cylinder and coil dough into a round patty, tucking the end of the dough underneath. Roll out again to make an 8″ circle about 1/8″ thick. Place a wide frying pan over medium heat until hot. Add 2 Tbsp. cooking oil, swirling to coat sides. Add 1 cake and cook, turning once, until golden brown, 2-3 minutes on each side. Remove and drain on paper towels. Repeat with remaining cakes, adding cooking oil as necessary. Cut cakes into wedges (I generally go for six), and serve with dipping sauce. If you’re thinking of making this ahead, experimentation indicates that this dough really does not refrigerate well. If, however, you make the pancakes and freeze them flat wrapped in plastic, they thaw and fry up nicely. Spam Fries with Key Lime Dip at A Tiger in the Kitchen. Sausage Rolls at The Asian Grandmother’s Cookbook. Homemade Pizza Rolls at Dreaming of Pots and Pans. Fry Sauce with an Asian Twist at HapaMama. No-Time-To-Wait Nachos at Monday Morning Cooking Club. Tater Tots, Fried Pickles, Peppers, Cheese Whiz and Garlic Bread Burger at Sandwich Surprise. Sam Sifton’s Trini-Chinese Chicken at Spicebox Travels. Farm Fresh Corn Fritters at Hot Curries & Cold Beer. Spam and Kim Chi Sandwich at Vivian Pei. Heavenly Hash Popcorn at Free Range Cookies. Chocolate Chewy Squares from Jonathan Santofler. This entry was posted on Friday, July 12th, 2013 at 7:00 am	and is filed under Manna. You can follow any responses to this entry through the RSS 2.0 feed. You can leave a response, or trackback from your own site. I adore scallion pancakes! Have never tried making them though … now I’m going to have to try! Thanks for sharing…these look delicious! They’re totally reliable and easy; they’re really best when they’re still warm and don’t keep well, but, really, aren’t you going to want them fresh out of the pan anyway? I could eat these anytime! And I also enjoy Martin Yan’s dependable cheer and effervescence. Welcome back to LetsLunch! Thanks — I missed it! Hopefully I will have better kitchen karma for the rest of the summer. Oh dear, I LOVE scallion pancakes! And just picked some fresh produce up at the Farmers’ Market. Bet you can guess what I’ll be making . . .
Oh, the farmer’s market! I haven’t been in a while, I think I’m missing out! I don’t eat scallion pancakes often enough so I’m going to have to make them at home. Thanks for sharing! Yum! Would it be wrong if I tried this recipe with garlic scapes? I just saw an article on it and the idea of that with this is making me famished! Oh, that’s a brilliant idea! I’m always looking for excuses to use the seasonal produce at this time of year. If you try it, you’ll have to let me know how it turns out. Annabelle, I LOVE scallion pancakes but have never made my own. I think it’s time…thanks for sharing this great recipe. These pancakes look so, soo good! –This looks fabulously delish 🙂 I want!